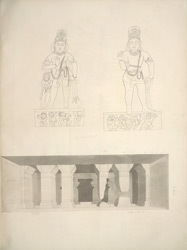 Pen-and-ink and wash drawing of sculptures of guardian figures (dvarapalas) from Cave II, Badami (above) and Cave I, Badami, from an Indian draftsman, dated 1853.
the town. Around the south fort there are four rock-cut cave temples. Cave II was excavated in the late sixth century and is dedicated to Vishnu. It consists of a long porch, a pillared hall (mandapa) and the small sanctuary in the rear. This drawing represents the two guardian figures that flank the porch entrance. The cave is decorated with large panels of Varaha and Trivikrama. Cave I, depicted below in the drawing, is the earliest of the rock cut caves of Badami and belongs to the late sixth century. It consists of a large columned hall (mandapa) and a small square sanctuary. The column shafts are incised with jewel and garland motifs and miniature medallions containing figures. Large sculpture panels in the porch depict Harihara with Lakshmi, Garuda, Parvati and Nandi (left) and Shiva with Nandi (right).